Of the two images above, which do you prefer? You don’t even have to know what we’re talking about or referring to but the choice is obvious! Anyone paying out of pocket for their healthcare would choose the option that provides a clearer breakdown of costs. I had a realization a couple weeks ago while presenting at Momentum, Modernizing Medicine’s EMR User Conference. I was explaining how the Ohio Surgery Center uses the BuildMyBod Health Price Estimator to disclose allowables for procedures based on the patient’s insurance plan. Yes, the consumer’s out-of-pocket costs are indeed estimates. 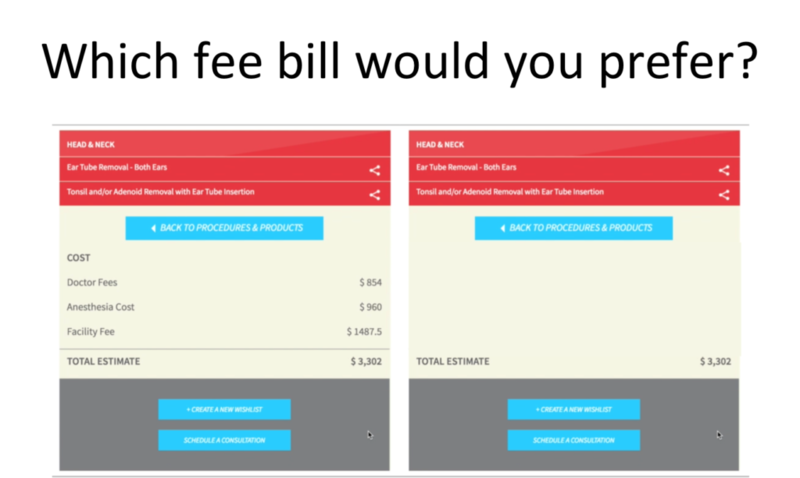 But by simply breaking down the costs, as seen in the screenshot above, this is still very educational for the patient. In the example, above, it’s obvious there’s a fee from the doctor, anesthesiologist and facility. In other words, even if the estimated allowables aren’t perfectly correct, the patient still benefits from the display of the various costs that go into a procedure. Another example. When a patient gets a colonoscopy, they may only expect a bill from the doctor. But when they submit a “wishlist” through the BuildMyBod Health Price Estimator, they’ll also realize the other fees. Doctor, facility, anesthesiologist and probably the pathology lab. By disclosing this ahead of time, the patient is less likely to experience sticker shock. So rather than the facility focusing solely on the accuracy of the estimate, the completeness of the estimate is the real patient satisfier. This entry was posted in Healthcare Costs, Practice Management, Procedures, Technology and tagged BuildMyBod Health Price Estimator, High Deductible Health Plans by Dr. Jonathan Kaplan. Bookmark the permalink.